I don't think there's anyone, in the U.S. at least, that hasn't heard about the $1.3 $1.4 $1.5 B Powerball lottery that will be drawn tonight. That's right a B not an M. A 1 and a 5 and then 8 0's. I don't normally purchase lottery tickets because it's a tax on people that can't do math, but $1.5 B has me intrigued so I went ahead and threw $10 at it. Just in case. 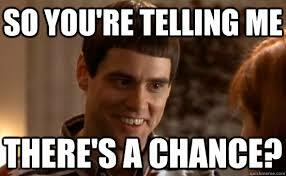 I know that the odds of my wife and I winning the Powerball are slim to none*. Well, probably closer to none to none, but that $10 won't break us and who doesn't like to dream a bit. Of course the $1.5 B is actually closer to $930 M if you take the cash instead of the annuity and you'll actually only take away about $560 M after the government gets it's cut. 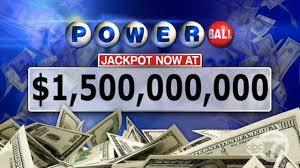 ** But I think we would be just fine with a $560 M lump sum. That kind of money is life changing and would quickly throw us into the upper echelon. Although I have a feeling that we'd never rub elbows with them. While my wife and I don't lack much of anything and overall I'd say our lives are around an 8 out of 10 on an arbitrary happiness/contentment scale. Overall we're quite happy but seeing as how I'm at work as I write this and my wife will be getting up in a few hours to head to work as well, we don't own our time. That's the biggest benefit to winning the Powerball. It would immediately thrust us over the hump to financial independence and as long as we don't screw it up it would allow for our whole family tree to be financially independent as well. Dreaming of how you'd spend that money is the draw of playing in lotteries. Surely people don't expect to win, right? So what's our plan if one of our five chances hits? 1. Sh!t myself. Have a heart attack. The first thing I'd do is head home and quit my job. I currently have a job that requires me to be gone for weeks at a time so that would be priority number one. 2. The next thing I'd do is get away. I don't know where and telling you all wouldn't make much sense but my wife and I would disappear somewhere for at least a month so we can try and escape all of the hoopla. Let's assume costs of something like $20k. 3. I'm not a car guy at all but my current vehicle is a 2008 Honda Civic with 120k miles on it. So I'd upgrade that although probably nothing too spectacular but maybe I'll spring for 2 cars. A convertible and an SUV so let's call it $100k. 4. We'd then purchase some property, either in Central Texas or Colorado or heck why not both since we have a ridiculous sum of money, and get to work designing our own house. I've always wanted to design our house and get it exactly how we want it. We'll assume that costs us $3 M to get the property and build. I doubt it'd be that much but we might as well go big. 4. We'd travel a heck of a lot more than we currently do. If we're lucky we can take 1-2 trips per year currently. If we won that kind of money I'd like to travel at least 6 months out of the year. Of course all that travelling would be done in First Class and likely in nicer hotels. 5. I'd take $100 M for investment purposes. At a 3% yield that works out to $3 M in annual income which is way more than enough to cover all of our elevated expenses, extensive travel and allow us to continue to invest money each year into other ventures. Investment capital would be split between dividend growth stocks, index funds, and rental properties. 6. Ideally my wife and I would have 2 kids and I have no intentions of letting them rely on their parents' hard work extremely good luck. They'd be required to go to college so let's call that $500k to be set aside. Sheesh, there's still $450,880,000 left to go. This really is a ridiculous sum of money. 7. Let's say something like $5 M to each adult and $3 M for each minor among family members that I currently keep in contact with. That's 19 adults and 10 minors so there goes another $125 M. The money for the minors would be placed in trusts with certain conditions such as graduating from college or other trade school and potentially other requirements. 8. I'd venture to guess that we'd do something similar for friends so let's call it 40 friends at $2 M a pop. So $80 M.
9. I've always thought it'd be cool to have a scholarship in my name and my wife feels the same way. So we'll set up 2 scholarships that provide $30k in annual tuition. Note I have no idea what the going rate is for in state tuition so this could likely provide more scholarships. At a 3% yield that works out to $2 M.
Man, $248,380,000 left to go. 10. There's no way I would only bless my family and friends with our extremely good fortune. Plus I love those huge paper checks. Let's take another big chunk out and put it in trusts for certain organizations/charities/nonprofits that I want to support. So $200 M set aside would provide $6 M per year in donations that I could give out with those huge checks. Sounds good to me! 11. Subtracting all of the expenses/investments leaves me with $46,380,000. I'd assume there'd be some fees to set up these trusts and I'd likely have to hire a team of support staff such as lawyers, accountants and a whole host of people that I can't even think of so there'd be some other expenses related to that. Let's assume there's another $3 M in expenses related to these things. 12. I'd give back to all of you as well. I'd set aside $10 M in a trust to give me money each year for the sole purpose of giving it out to all of you. At a conservative 3% yield that'd be $300k I could give out each year to all of you. So you all can expect some of those ridiculously oversized checks as well. You didn't think I'd deprive you all of that did you? There's still $33,380,000 left so other potential uses for the remainder of the windfall would be becoming an early investor in some startup companies. I'd love to be a venture capitalist, but obviously I've never had the funds for it. I'd also use the remainder of the money to start a few businesses myself and honestly who knows what else. And heck while we're at it let's build up a nice rainy day fund as well. Even after blowing through about $530k there's still a ridiculous sum of money left. Of course I could have just skipped all of this thoughtful planning and just gone with this guys plan. *It works out to 1 in 292,000,000 odds. **I think I know who the real winner is here: good, old Uncle Sam. Do you every play the lottery? What would you spend your jackpot on if you happened to win? I don't think I'll ever win the jackpot but as you say, who doesn't like to dream a bit! The 'fun' I have with the lottery is talking to friends and colleagues about what we would do if we won the big one. I'm not counting on winning the lottery to be part of my retirement plan but it would certainly bring about my plan a lot quicker! If I won such a big amount, I would give most of it away to my family and close friends. The rest would be invested (likely to include property) and used for charitable purposes. Anyway, good luck to you with your tickets! Great article - I agree that the fun of playing the lottery is dreaming of what you'd do with the money. I'm much too boring, as I always talk about how it'd be invested to generate even more income, rather than spending big. I did read an article on Jack Whittaker ($314M lottery winner), and how horrible his life was after he won the jackpot. You'd definitely have to buy your properties in the name of a secret corporation so you'd not be hounded by all the people looking for handouts and calling you selfish! Good dreams, and fun to read. Thanks for sharing! Stop by Colorado for a beer when you win. Of course, like everyone, I would not mind a handout too. Hookers and Cocaine, lol. The guy in the video is awesome. Way too much money for me. I'd be just as happy to win just a couple of mil. Would meet all of my requirements! Great wish-list. I've carried an experiment several times playing Powerball (with the recently increased guess range) and Thunderball offering better winning chances. And you know what every time I failed to win any of them. Maybe it's just my bad luck. Hope you'll be luckier and win big to accomplish your plans.